“Start with the End in mind.” is a very popular concept for how to build a business. It helps create guidelines for what needs to be accomplished in order to succeed and reach a final goal. That’s tough when there really is no end to achieve. The martial arts is a lifelong journey that doesn’t have an end, just a few stopping points. It would explain why there is such a large attrition rate at Chodan (1st Dan Black Belt). In too many instances, the training is “sold” to “achieve” a black belt. Now that the goal has been reached, on to the next activity. That hard ending point doesn’t provide opportunities for further growth and development. This seems to be a common thought in our society. People spend time being active in attaining goals but not in growing as a person. Trendy and popular has replaced knowledge and education. 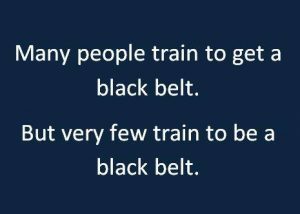 There are more people who can claim being a black belt everyday. The martial arts industry has bought into the concept also. If you attend tournaments, how many people do the same pattern? How many of them are from the same school? What’s worse is how many, let’s say weapons patterns, are the same and being done by people from 10 different schools? It is also their training that will help them develop in all the areas of their lives. The time spent mimicking others doesn’t help you in the end. Students regularly do this. A common scene is when I ask a student if they know their next hyung (pattern). Many reply that they are but they are the ones who are peeking over their shoulder to follow their peers. I use the correlation that, just like cheating on an test in school, if they get it wrong, so will you. Wrong techniques are compounded. 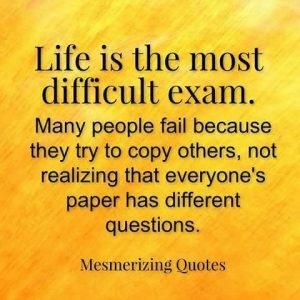 Those who are successful in life are those who figure out how to work hard and how to learn. Education, training, application and teaching will take you much further than mimicking others.